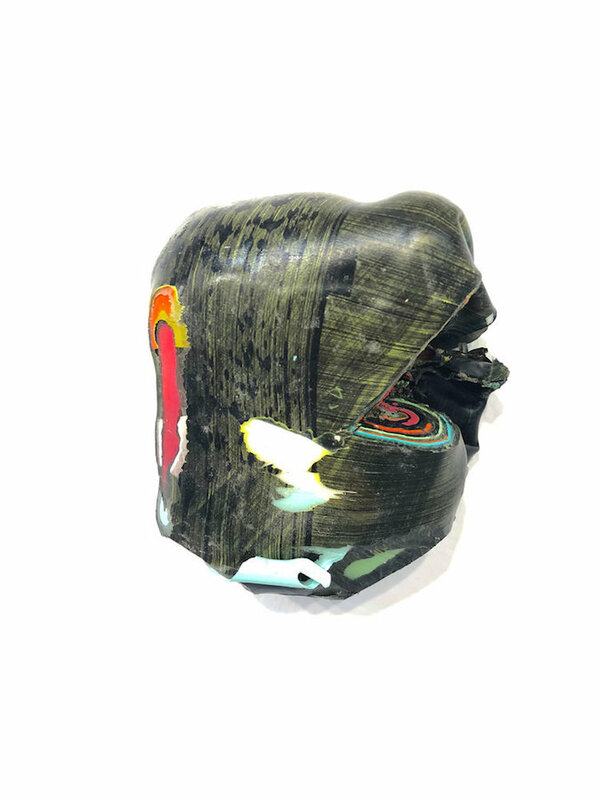 Liz Miller: You recently did a residency at the Golden Foundation in 2017 that yielded exciting results—I loved seeing your experimentation with pouring paint, utilizing paint skins in sculptural and semi-sculptural ways, etc. Can you talk a bit about how the residency impacted your work? Joey Slaughter: The Golden Residency was an amazing experience. It was my first residency. I have an extremely supportive family. I’m married with two kids, 8 and 11. I just couldn’t leave my family for long before last year. Getting to go to Golden, having access to all their products and technicians was a dream come true. I went there thinking I would make some drawings into wall sculptures, but once I got there we had to do a short 15 minute talk to the Golden Foundation and with Golden’s Paint experts. I realized while talking to them I needed to experiment and just take advantage of the experience and not think about making finished work. The residency gave me exciting new options in making my work. In the end it taught me how to be organic again. Before the residency everything was purely sharp angles. The most valuable lesson learned from Golden was learning to have a better studio practice. I buy in bulk now and monitor my supplies. I lay out my studio with more thoughtful intention. The Golden’s are some of the most generous people you could ever meet. Liz Miller: In contrast to the works you created at the Golden Foundation in 2017, your most recent works are hard-edged and lacking in apparent texture, as if you are pushing back against the works you created in 2017. Why the shift? Joey Slaughter: Until I can merge them, I currently think of the two as separate bodies of work. I haven’t figured out a way to marry the two. It’s extremely frustrating. Currently, I am at the Hambidge Residency in Rabun Gap, GA, trying to do this. I am not sure if I will be able to accomplish this goal because of the rain and humidity here. Pouring paint can be very temperamental depending on the weather. The two ways of working you speak of aren’t really that different in content. I am aware though they look different. They both start off with words/phrases, from music or archived conversations. The colors match moods or the impact the phrases have on me. The shapes match a sort of thought process in action, similar to the thought cloud or word balloons you see in comic books; mine just don’t look like clouds… they are isolated instances of a relationship between those phrases and emotions. I imagine processes in the brain to be abstract, and busy. Cutting the paints skins or cutting wood involves the same basic ideas between the two ways of working. The skins seem to have more of the emotions embedded in them than the wood. I believe this because I pull them away from a surface and handle them. The end product of a pour is blind, reversed like a monoprint. I don’t know what it is going to look like until its dried and I pull it up. Controlling the CNC machine with a tool path is quite an operation. Just controlling this machine to do what you want is a venture within itself. Pieces and collaging are important to me, as they each involve a cutting action. I really think of all the cutting tools as equal, whether it be a CNC machine, scissors, lasers, etc – they are all the same to me. It’s the individual pieces that I am concerned with. I am interested in how they work with another shape or color and how they make up a whole (phrase/shape). I am interested in what registers in the brain with all the business in our world. With pouring paint and making collages from poured paint I go back and forth between being in control and letting the materials dictate what they do. The process is organic, but I choose the colors and lay them down in a very specific composition. Pouring paint though has a life of its own: how it will flow, how fast or slow, how the weather will affect it. At Golden the process took 4 -5 days to peel a skin. In Louisiana it only takes a day if there are fans. Liz Miller: Your artist statement talks about conversations as the impetus for your paintings. Can you elaborate? Are the shapes and colors in your paintings coded? Or is the translation less literal? I sense both intuition and careful schematics in the creation of your work, and am curious about how play and planning meet up. Joey Slaughter: Play and planning definitely make up the drawings. I use Rhino or Adobe Illustrator to make the drawings. I use Adobe Illustrator for the color. Certain words and phrases just get stuck in my head sometimes. I am pretty sure it happens to everyone? I think they call them earworms? I’m working on a solo show at Cole Pratt, New Orleans, and the premise is archived lyrics that have been stuck with me for a while. For example, the phrase “Detroit leaning” from the Pretenders’ song “Brass in Pocket”. That phrase is intriguing to me, what does it mean? Is she cruising the streets of Detroit and chilling laid back with the windows down? Or is it about avoiding Detroit? I’ve experienced both sides of those two options. Color is approached as if I was a synesthete. As I replay those phrases in my head, I just feel color deeply! It’s more to me than what people call a formal composition of tints, tones, and shades. I hear, feel and see those words and use my emotion of color to make them. When a viewer uses the word “formal” it’s usually a lack of investigation, saying that the work is the void of content. It’s a lazy word. 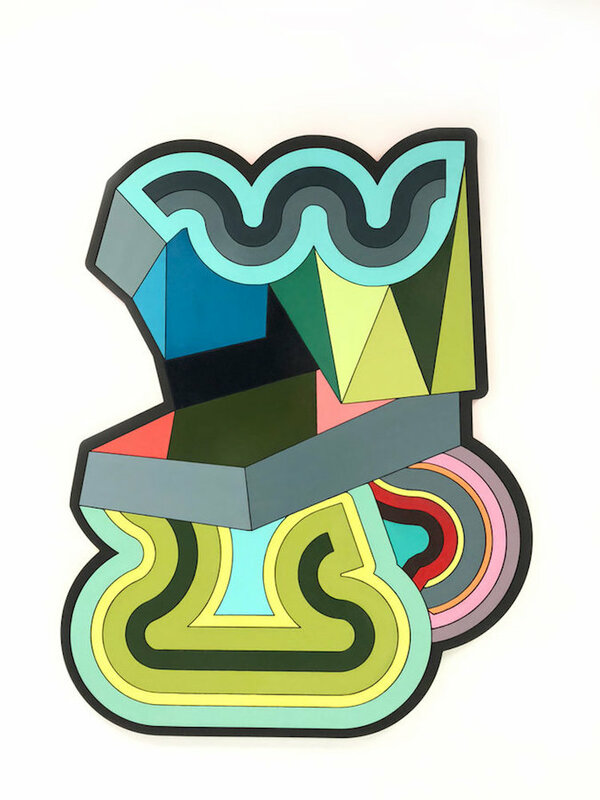 Liz Miller: I see all of your paintings as sculptures in some sense. Of course, you have worked in ways that are very three-dimensional, but even in your flattest two-dimensional works, the act of assembling and constructing the support seems paramount, as does the edge of the picture plane, which is often an irregular shape. How do you see your paintings in relation to sculpture? 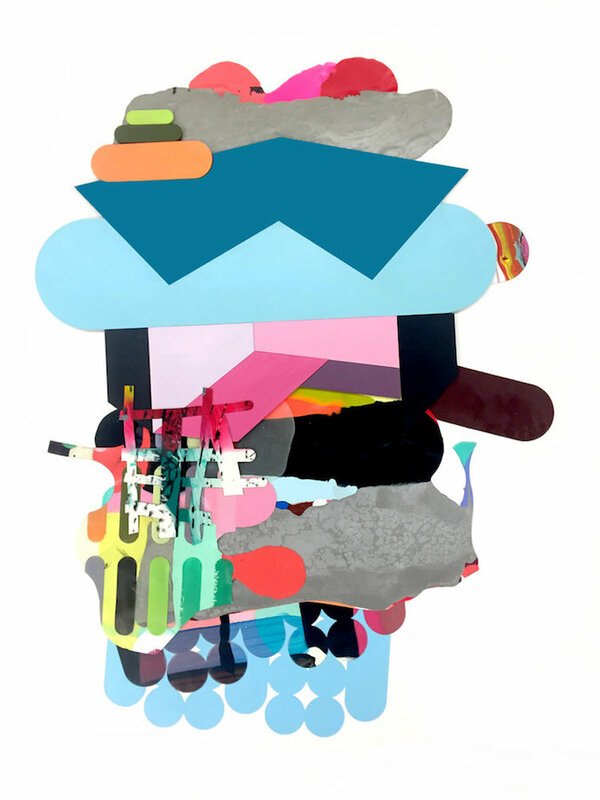 Joey Slaughter: I see them as both, many people look at them as sculptures but just cutting and assembling feels like sculpture to me, also the illusion of depth via color helps create that experience. I just love playing with format of a painting. The irregular formats are derived from the idea of thought clouds, word balloons, or speech bubbles. The shapes are inspired by the phrases and are a way to see the inner workings of a thought in action, with the shapes being the container of a thought, the composition being the business of a thought in action. Bursts of color help portray the emotions. Joey Slaughter: I really want to combine the paint skins with the wood cut outs to have that blend of tight and loose. Making decisions is difficult in combining these two ways. As I write this I am waiting for paint to dry in the damp Georgia Blue Ridge Mountains. The wait is horrible! Please come to see my show December 7th At Cole Pratt Gallery in New Orleans. Joey Slaughter: Instagram!!!! Please join me on instagram @joey_slaughter to see more work and my process. Joey Slaughter earned his BFA from Memphis College of Art. He received his MFA from Cranbrook Academy of Art. Upon graduating Cranbrook, Slaughter was awarded the prestigious Joan Mitchell Foundation Grant. He has received the Louisiana Division of the Arts Career Enhancement Grant, He has been published Fresh Paint and in New American Paintings magazine three times. In 2017 he was nominated the Louisiana Prize from South Arts and received the Sam and Adele Golden residency. This year he will attend the Hambidge Residency in Rabun Gap, GA. 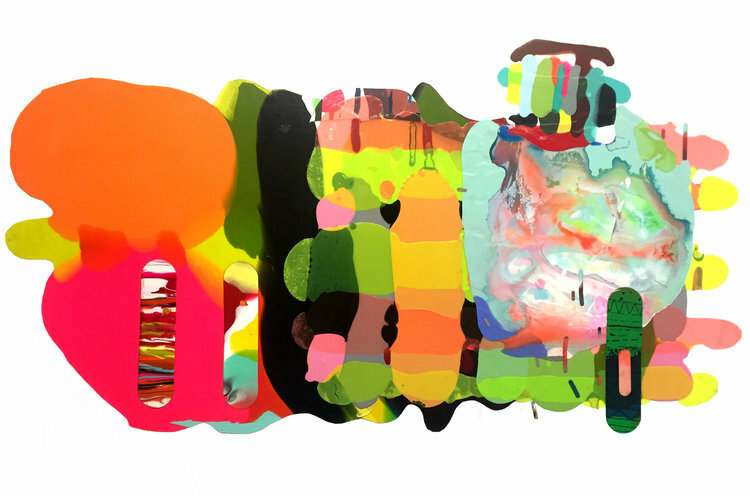 He is currently living in Ruston, LA, and is Associate Professor of Art at Louisiana Tech University and represented by Cole Pratt Gallery, in New Orleans, LA.